Thank you to the University of Arizona School and Home IPM Team for this informative newsletter. Each year between 5 to 20% of the U.S. population will get flu. The economic cost is estimated at $10.4 billion per year in direct medical costs and an additional $16.3 billion in lost earnings. The Centers for Disease Control and Prevention (CDC) reported January 11, 2019 that between 6.2 million and 7.3 million people have been sick with flu so far this season (since Oct. 1 2018), about half those people visited a doctor, and up to 83,500 people have been hospitalized in the U.S. 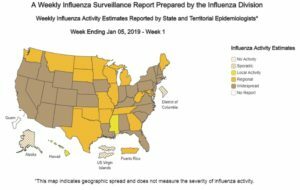 There has been widespread flu in 31 states. Influenza viruses typically circulate in the United States annually, most commonly from late fall through early spring. Flu is more dangerous than the common cold for children. Each year, millions of children get sick with seasonal flu, thousands are hospitalized, and tragically, some die from flu-related complications. The CDC recommends annual influenza vaccination for everyone 6 months and older with any licensed, age-appropriate flu vaccine (IIV, RIV4, or LAIV4) with no preference expressed for any one vaccine over another. CDC has published “Prevention and Control of Seasonal Influenza with Vaccines: Recommendations of the Advisory Committee on Immunization Practices – United States, 2018-19 Influenza Season” on the recommendations for use of vaccines for the prevention and control of flu during the 2018-19 season in the United States. Current U.S. statistics indicate that the flu vaccine is reducing the risk of illness by 40 to 60 % (CDC), and even if you do get the flu after receiving a flu shot, the illness may be milder. It is ideal to get a flu vaccine before flu begins spreading in your community. It takes about two weeks after vaccination for antibodies that protect against flu to develop in the body. The CDC recommends that people get a flu vaccine by the end of October, but getting vaccinated later, can still be beneficial, even in January or later. Flu comes every year, but the health impacts differ depending on when, and which strains start circulating. In recent years, flu related deaths have ranged from a low of about 3,000 to a high of about 49,000 people per year. Hospitalizations also range between 140,000 and 710,000 annually (CDC). During 2012-2013, about 45% of the U.S. population got vaccinated, helping to prevent an estimated 6.6 million flu-related illnesses. Any person experiencing chest pain or breathing complications should seek immediate medical assistance. The flu can also exacerbate (make worse) chronic health problems like asthma and chronic obstructive pulmonary disease (COPD). Most people recover completely within two weeks, but some develop complications, such as pneumonia. Pneumonia in very young children or in adults older than 65 is cause for concern as the symptoms can become life threatening, and may result in death if left untreated. Bronchitis, sinus and ear infections are other common complications resulting from the flu virus. Influenza antiviral drugs may be prescribed to treat influenza infections. Antiviral drugs are a second line of defense that are used to treat flu if you get sick. FDA approved medications are prescribed by your doctor and include: oseltamivir phosphate (available as a generic version or Tamiflu®), zanamivir (trade name Relenza®), peramivir (trade name Rapivab®), and baloxavir marboxil (trade name Xofluza®). So how can caregivers and facility managers maintain a healthy indoor environments, and limit the spread of the flu virus? Flu viruses spread from person to person mainly by droplets made when people with flu cough, sneeze, or talk. Less often, people might get the flu by touching a contaminated surface or object, and then infect themselves by touching their own mouth, eyes, or nose. Most healthy adults are capable of infecting other people 1 day before symptoms develop, and up to 7 days after becoming sick. Children may pass the virus for longer than 7 days. Symptoms start 1 to 4 days after the flu virus enters the body. Stay home from work, school, and errands when you are sick. This will help prevent others from catching your illness. Avoid close contact with people who are sick or who have chronic illnesses. Teachers and staff managers, please accommodate students and workers keeping up with schoolwork or work projects from home as much as possible. If you are ill cover your nose and mouth with a tissue when you cough, sneeze or talk. Throw the tissue away immediately after use and wash your hands with soap and water. If a tissue is not available, cover your mouth and nose with your sleeve, or the crook of your elbow. This has been named the “vampire sneeze”, and catches on well with young children. If you cover your mouth and nose with your hands, wash them immediately. Wash your hands often with soap and water, especially after you cough or sneeze. Give children the opportunity to wash their hands and encourage children to wash their hands effectively: 1) Rinse hands and arms up to the elbows, 2. Apply soap and lather for at least 20 seconds (sing the Happy Birthday song twice) cleaning hands, arms, and fingernails, 3. Dry with a paper towel. NEVER have children use disinfectant wipes as hand sanitizer wipes, these are two very different things. Avoid touching your face, especially eyes, nose, or mouth. Encourage children to avoid touching their own or others’ faces. 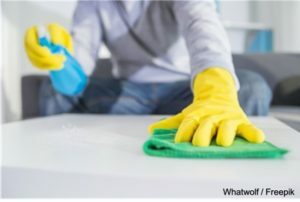 Clean and disinfect surfaces or objects.This is a job for adults, who can accurately use products correctly following all the steps necessary as provided on the label. Here are five important things to know as you combat the flu virus. Know the difference between cleaning, disinfecting, and sanitizing. Cleaning removes some germs, debris, and dirt from surfaces or objects. Soap and water significantly improves the physical removal of germs from surfaces. Disinfecting kills germs on surfaces or objects. Disinfecting alone will not clean dirty surfaces but disinfecting after cleaning further lowers the risk of spreading infectious germs. Disinfectant wipes are registered pesticides as they are designed to kill, or inactivate microbes. Sanitizing lowers the number of viable germs on surfaces or objects to safe levels, determined by public health requirements. When addressing pathogens in the built environment, select the cleaning product based on the need. While soapy water is sufficient to clean up a drink spill, it is not the best option for all jobs, for example, a disinfectant is required to clean wrestling mats to prevent the spread of infectious skin diseases like ringworm (a fungal infection of the skin). Remember that disinfectants are registered pesticides and therefore the label must be followed in order to avoid health problems, such as eye injuries, chemical burns, and respiratory illness, as well as to achieve effective disinfection. School aged children should NOT be touching them. KEEP OUT OF REACH OF CHILDREN is on the container. They are sometimes used as hand and even face wipes by children, and many contain eye irritants as well as respiratory irritants that affect asthmatics. Disinfectant wipes are registered pesticides as they are designed to kill, or inactivate microbes. Unfortunately they can be used incorrectly, e.g., people should use gloves, or at least wash their hands after using them. Clean surfaces and objects that are touched often. Daily sanitize surfaces and objects that are touched often, such as desktops, countertops, door handles, computer mouse and keyboards, faucets, and phones. The flu virus can remain in an infectious form on a surface for up to 48 hours. It is not necessary to close work places, childcare facilities or schools to clean or disinfect because of flu. If facilities are closed due to staff shortages or student absenteeism during a flu outbreak, it is not necessary to do extra cleaning and disinfecting. Normal cleaning and disinfection practices are sufficient to remove or kill flu viruses. Wash surfaces with a detergent to remove dirt. Apply an EPA-registered disinfectant that is approved to kill influenza virus, following label directions exactly. Disinfection usually requires the product to remain on the surface for a certain period of time (e.g., letting it stand for 3 to 5 minutes), and may need to be removed with clean water. Follow label directions exactly. Remember to read the label, washing hands after use should be exercised by anyone using these products without gloves. Products have specific directions on labels and hazard warnings. Chemically protective gloves and eye protection is advisable and may be legally required. Never allow children to use disinfectants or disinfectant wipes. Do not mix detergents with disinfectants unless the label explicitly states that it is safe to do so. Combining products can result in serious injury or death. Mixing chlorine bleach and ammonia cleaners produces a lethal chlorine gas. Commonly used products contain bleach (hypochlorite) and ammonia e.g., toilet bowl cleaners often contain bleach, and window cleaners often contain ammonia. Ensure that anyone using cleaners and disinfectant products have access to labels in a familiar language, and can read and understand the labels. Follow standard institutional procedures for handling waste, which may include wearing gloves. Place no-touch wastebaskets where they are easy to use. Avoid touching used tissues when emptying wastebaskets, or wear gloves if tissues must be handled. Wash your hands with soap and water after processing waste and dispose of gloves. Stay home if you are a sick and work as a food handler. Influenza viruses from sick food workers can contaminate food if workers do not wash their hands properly, cough, sneeze, or talk over food that will not be cooked (e.g., salads or sandwiches). People who eat contaminated food can then get sick. This entry was posted in Newsletter and tagged flu prevention, flu season, health habits, how to prevent flu spreading in schools, influenza, school integrated pest management. Bookmark the permalink.